The Loomis model has 4 Beds and 2 Baths. This 2204 square foot Double Wide home is available for delivery in Nebraska, Colorado, Kansas, North Dakota, South Dakota, Wyoming, Iowa, Missouri. The Loomis is ideal for larger families. The open kitchen configuration allows a full view of the combined living and dining space so that the cook can see what everyone else is doing while they’re working at the bar top island. The corner walk-in pantry provides plenty of additional storage and the large family room, an added bonus, makes a rare appearance. 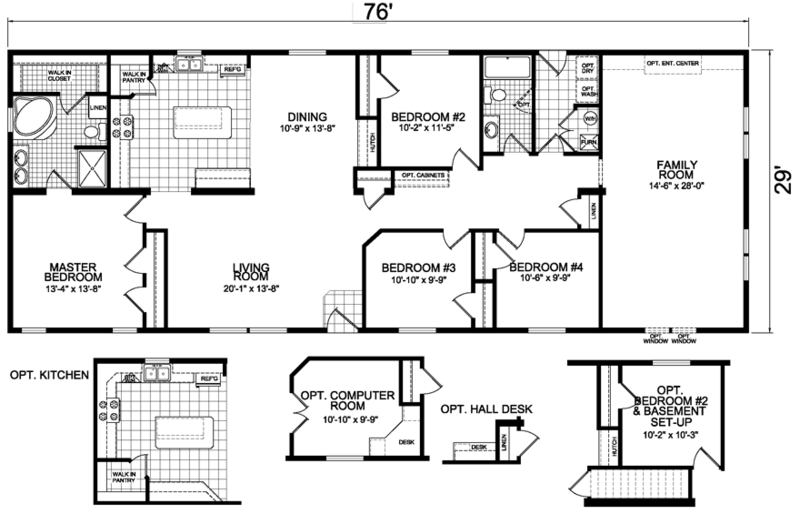 Options include alternate kitchen and bedroom layouts plus a computer room and hall desk. Ask your housing consultant about the other great features that come standard on the Loomis manufactured home.